Move over hamburgers and other meaty treats – make way for the meatball! And I am not talking about the kind your mum used to make and slap alongside three veg (although they were indeed also very delicious), oh no siree! 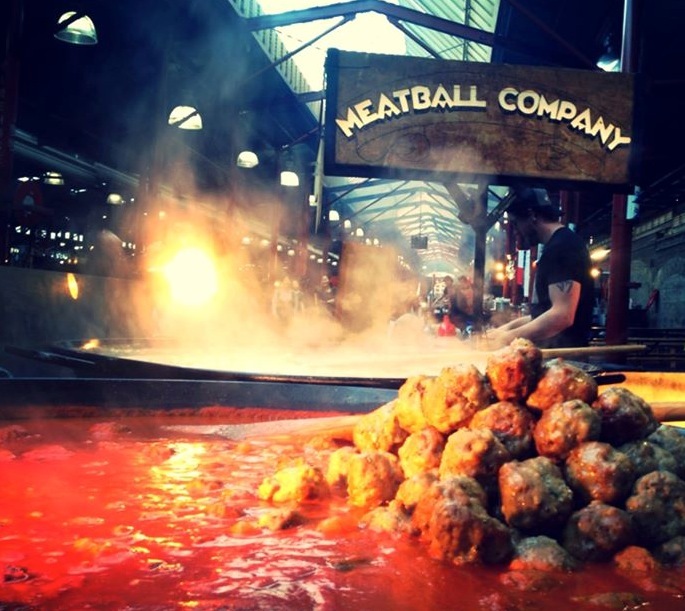 The humble meatball has been revolutionised and is popping up all over town in various guises. Here is your go-to list of where to find the best meatballs in Melbourne. The Meatball & Wine Bar is without a doubt Melbourne's meatball mecca. What the 'G is to footy and the Espy is to live music…. You get the drift – it's awesome. Matteo Bruno, a television and film producer, opened the first Bar in bustling Flinders Lane in the latter half of 2012, before spawning another edition in Swan Street, Richmond about a year later. And, hipsters of the north rejoice – a third chapter will open in Smith Street, Collingwood in April, just in time for the Easter break. Balls & All is the pick of the menu here. For $21 you choose a ball (pork, beef, chicken, fish or veg), a sauce (red – Italian tomato, white – creamy, green – pesto salsa verde) and something for your balls to sit on (Italian beans, creamy polenta, super MB potato smash, homemade pasta or something veg). And do not leave without trying a whoopee mac – homemade ice cream sandwiched between two cookies – or the meatball police will be called. South Melbourne has born a brand new hole-in-the-wall cafe dedicated to these round morsels of awesomeness. Mama's Meatballs was the brainchild of locals Zoran Radovanovic and Helen Michael, who saw a gap in the market for a takeaway alternative to a burger. And when you try them, boy, you'll be glad they did. After years of home cooking and six months in the test kitchen, Michael has mastered the recipe for some of Melbourne's best meatballs using only local ingredients. There are six flavours to choose from – traditional (beef and pork), pork and fennel, vegetarian (chickpeas and spinach), BBQ (beef), fish, and chicken and pine nut. Then choose from a cup, sub, wrap, roll or mini roll for them to lay their pretty little heads on. Handy dinner and family packs are also available. Right in the heart of Melbourne's very own Little Vietnam is a Thai sensation. No, that's not a typo. Nestled down a side street off Victoria Street is Jinda Thai, which is jam-packed on any given night. The eclectic warehouse dining room is characterised by exposed brick walls, funky furniture and dainty lanterns, but the stand out feature is the striking portrait of Grandma Jinda who watches over diners as they tuck into their Thai treats. Meatballs don't exactly spring to mind when you think Thai, but you simply can't go past the homemade pork balls at Jinda. These bite-sized beauties make the restaurant's recommended list of menu items and on consumption it's not hard to see why. The pork mix is a secret family recipe, lovingly coated with a pepper and garlic sauce, served on a bed of rice with a little side salad. Certainly worthy of a trip off the beaten track. If you haven't got a festival in the diary, then put one in now. But before you do, like The Meatball Company on Facebook to see where they'll be taking their mobile kitchen next. Cos, in my humble opinion, no Melbourne meatball list would be complete without these guys. Cooked in what looks like a ginormous cauldron, there are usually two to three types of meatball on offer – chicken, sage and pancetta; beef and mozzarella; and pork, fennel seed and chilli. You can devour them as a slider, in a bag or bun, or on top of a mouth-wateringly good garlic 'tater mash. And while we're on the subject of potatoes, make sure you get a side of shoestring fries, which are tossed in a special seasoning – they're almost as good as the balls! The Prahran Market is a hub for all things sumptuous, with The Fresh Pasta Shop one of the many highlights. Owner John Pillakis has been hand making, as the name suggests, fresh pasta for 14 years, and prior to this was dishing out goodies at Cleo's deli. One of his best selling items at Cleo's was his homemade Thai Chicken and Cambodian Beef Meatballs. So popular in fact, they're now a staple at The Fresh Pasta Shop, but Pillakis insists they are not for pasta! What makes them so good is the abundance of Asian herb coriander, not to mention the slathering of sweet chilli sauce on the chicken balls and 'special' sauce on the beef: a combination of sweet chilli, fish, oyster and more. It's very easy to get distracted in Hawksburn's food haven, Stocked. One glimpse in the window and a cheese sample later, and you'll have forgotten what you've gone in there for – you'll want to take everything home! Whatever you're purchasing do not leave without a container of the beef meatballs. Hand rolled and made in store, the chef attributes their rich flavour to fresh herbs and homemade sugo. Serve with pasta, parmesan and a fine drop of red, and you'll be in meatball heaven. Perhaps best known for his scrumptious steaks and bang up burgers at Rockpool Bar & Grill, Neil Perry's Rosetta Ristorante is his first foray into Italian cooking. And it's safe to say he's nailed it. The position alone on the banks of the Yarra at Crown make it a must-dine experience, but the dishes are just delightful. The Polpette al Forno – that's 'meatballs in the oven' in Italian – are as traditional as they come. Served as an antipasti – that's 'starters' in Italian – the combination of beef and pork is sufficiently moist and immersed in an aromatic tomato sauce, complete with a sprinkling of parmesan. Another Italian eatery, Rossini, in the suburb of Malvern, is an iconic family favourite for those that live nearby. The menu offers an extensive list of pasta and pizza and if you were to pop into the kitchen, you'd almost expect to see a Nonna lovingly preparing the feast. The Penne al Ragu – meatballs and meat sauce – is perfecto. The generous serving of balls is intermingled with al dente penne and topped with a layer of parmesan. If you're lucky, you might even be serenaded by one of the waiters, making you feel like you've just stepped into a restaurant in Rome. Main Image Credit: Williams Sonoma. Post credit: Real Simple.